The final type of headache which we will be discussing is called Cervicogenic Headache. Cervicogenic headaches are generally caused by pain involved with the neck itself. As mentioned in the previous articles, muscular tension in these areas can be a big contributor. The only way to know which muscle is involved is to assess neck motion in a variety of different positions. Often times you will find one particular direction that is limited, which then would correlate with addressing a particular muscle group. This by far and away is the most common test that I find is limited. So it's not only important addressing the neck motion limitation, but give you ways of self treating at home so that you give yourself the best possible chance of not having the issue resurface. At On Track Physio, we not only focus on treatment that will help your symptoms. But also look big picture at what you can best be doing to address the cause of the issue as opposed to always being reactive and just addressing the result. This is how we can give you much better long term solutions. If you'd like to start being in control of your headaches, we provide a FREE Discover visit. This free appointment is all about getting clarity back into your life and providing you with potential solutions. In part 3 of our headache series we are going to be covering Migraine Headaches. Migraine Headaches are often described as either WITH or WITHOUT aura. An "aura" is a distinct sensation that is all to commonly felt just prior to a severe headache or migraine about to start. As opposed to tension type headaches, migraine type headaches tend to be more one sided in nature. People will often describe blurring of vision, sensitivity to light, nausea, numbness, possibly even vomiting. As mentioned with tension type headaches, neck position and muscle tension can play a large role into symptoms. Often times with migraines and cervicogenic headaches you will find neck motion limited to one side more so than another. The above picture shows muscles in the neck that are commonly referred to as the "suboccipital triangle". They tend to play a major role into limiting neck motion as well as irritation correlating with migraine and headache symptoms. Often times addressing these muscles properly can lead to effective treatment results. In combination with specific exercises based on range of motion limitations in the neck which you can perform at home is the best and most natural symptom resolution treatment options. If this sounds all too familiar for you, we provide a FREE Discover visit. This free appointment is all about getting clarity back into your life and providing you with potential solutions. Today we are back in Part 2 of our Headache Series. Tension type headaches is the most common presentation of headaches. Generally these type of headaches cause pain in the temple region which can also refer pain behind the eyes. These symptoms tend to be bilateral (meaning on both sides of the head). The pain is often described as a pressure or tightening pain (non-pulsating). The intensity is mild-moderate, and frequency of occurrence is quite high (> 15 per month). The picture above shows the area which people with tension type headaches feel it the most. Sometimes it can be referred to a "rams horn headache" because of the path the symptoms follow. As the name implies "tension" these symptoms are usually provoked from excessive muscle tension. The most common muscles involved are the upper trap, sternocleidomastoid, and suboccipital muscles. You have probably guessed it, the position of your neck which you assume frequently plays a big role in headaches. It's not that looking downward is bad or that your head should always be upright in a military type posture. It's that quite often we assume this position too often without changing position. It's no different than sitting on a hardwood chair for a long period of time, at some point you have to shift pressure and off load the buttcheek. 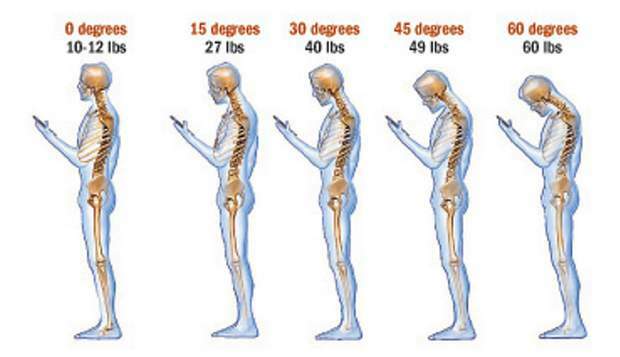 The problem becomes difficult when it is uncomfortable or difficult to change neck positions. More than likely this has been something accumulating over the years and over time developed into a bigger and bigger problem. How we address tension type headaches is first understanding what may be provoking them. This could be a certain activity, your daily neck position, overactive and tight feeling muscles, or a limited neck range of motion. More than likely it will be a combination of these things. At On Track Physio, we have unique ways of addressing all of these limitations. So if all you have tried is some generic stretches/exercises, massage, and medication we have other effective options available for you! If you are tired of dealing with frequent, annoying, tension type headaches we provide a FREE Discover visit. This free appointment is all about getting clarity back into your life. Chances are that either you or someone that you know has been dealing with frequent/daily headaches or migraines. In fact, some research shows that migraines are in the 10 highest causes of disability worldwide (Steiner et al, Cephalalgia, 2003). So if you are currently experiencing this, please realize that you are not alone. Unfortunately for most people, they resort to medication for relief. Medication certainly helps some cope with these episodes. But for many others, the medication provides minimal to no relief for the issue. In both cases though it certainly is not a long term solution as chronic reliance on medication has many other negative health consequences. Perhaps the bigger issue with medication is that it does not provide any resemblance of control over the issue. We all know that when a severe migraine or headache hits, it stops you dead in your tracks and doesn't allow you to function normally throughout your day. You may have to use your vacation days at work, call off your fun plans for the weekend, stay at home inside and not enjoy the weather because the brightness is too much for you. At On Track Physio we know you don't want to be canceling fun plans last minute due to a sudden severe headache. Which is why we offer solutions to get at and find the root cause of the issue. By addressing it accordingly we can often give relief, decrease frequency of occurrence as well as intensity, and most importantly give you control back over the issue so that it doesn't prevent you from doing what you enjoy. When considering treatment, the big thing we need to understand is that there are a variety of different headaches. Which is why you need a clinician who understands the differences in order to give you the best shot at finding relief. Generic treatments will give you generic results! If you find this resource helpful, please share it with a friend. As always we would love to hear from you and discuss how we may be of benefit to your problem.